Situated on a hillside in a quite hamlet, this fabulous villa sleeps 6 and boasts an enormous pool terrace and balconies on the second floor making the most of the wonderful views, ideal for a ‘get away from it all’ holiday. The villa is a great place to get away, relax and enjoy the beautiful views and quiet surroundings. The local villages offer an authentic taste of the Canary Islands, including fantastic scenery, great restaurants that serve fresh, local produce and friendly locals. 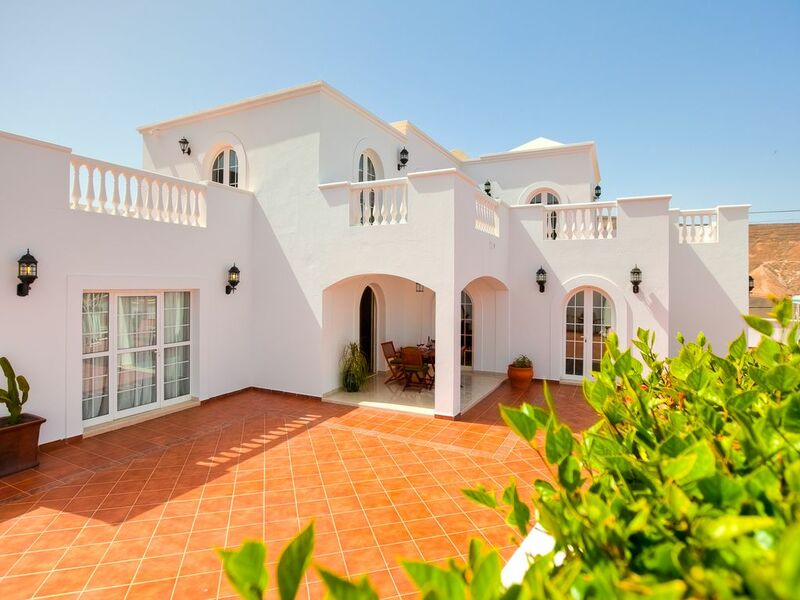 If you are looking for a real taste of Lanzarote then this is certainly the holiday property for you. Local Area: The picturesque fishing village of Arrieta with its excellent fish restaurants and safe beaches are only 1.5 km away, boasting crystal clear waters and great local tapas. The villa is managed by the delightful owners, who built the house as their family home. The drive way up to the villa is fairly steep. A variety of walks are to be enjoyed in the area and, apart from the fields under cultivation, there are numerous parts of the hillsides which have remained untouched so they are ideal places to observe the natural flora and fauna of this greener, northern part of the island. Although a wonderful, quiet, rural retreat, the bustling resort of Costa Teguise is only a 20 minute drive away and many of the most famous attractions on the island. Attractions & Site-seeing: Nearest beach town is Arrieta, 1.5km. The large town of Costa Tequise is approximately 13km, 20 minute drive to the South on the LZ-01. Tourist attractions such as 'Jameous d'Agua', 'The Green Caves', 'The Cactus Gardens' and 'Haria Market' are within a 10-15 minute drive from the villa and the beautiful island of 'La Graciosa.' is situated to the north on the LZ-01 past Orzola and is within easy reach. The nearest supermarket is on the LZ-01 at Arrieta garage, which you can see from the villa. It boasts a huge array of goodies, including you store cupboard basics, freshly baked bread, fruit and vegetables, toiletries and anything you made need for a fun day on the beach. Arrieta also contains several restaurants, a bakery, another supermarket which sells fresh meat and local produce. The Golf Course is in the town of Costa Tequise, which is around a 20 minute drive from Villa Temis. Coast & Beach: The villa overlooks the sea from the mountain village. It is approximately 1.5km to the beach town of Arrieta with the option to either drive (there is a car park located at beach La Garita) or take a stroll down the hill-side and take in the beautiful surroundings. If you walk through the town there is a small marina boasting great tapas bars and fish restaurants, as well as a supermarket and bakery. Amazing villa with loads of space. Villa Temisa is an amazing villa and the pictures don’t do it justice, it is certainly the best villa we have ever stayed in. The moment we arrived we felt relaxed and immediately in the holiday mood. The views were incredible and we spent many hours in and by the pool as it is totally private. The villa was very clean and well maintained and we even managed to have a couple of BBQs. I would recommend this villa. Best villa we have had in lanzarote for space and for the children. (Ages 4 and 2). Lots of space outside for them to play and the lounge was a good size for a party of 7. Pool was heated which was needed in February. Kitchen was well equipped, bedrooms were comfortable and spacious and bathrooms good also. Ideal location for us as we love Arietta and Haria. We had a warm welcome from the owners to this lovely villa right on THE hill of Lanzarote - our two cyclists were over the moon and we saw a car rally and a half ironman going up the hill during our stay. The villa is very comfortable with a lovely pool and very good bedrooms, bathrooms, living rooms and kitchen - we ate outside most of the time, making use of the barbecue. It is a good centre for most of the island - our surfers could easily get to Famara (also the wind surfer had a good day there) and other surf beaches. The local beach is good with a good restaurant on the beach. Lots of places to visit and lovely walks ( I recommend Caldera Blanca) - A wonderful fortnight's holiday! Una casa maravillosa, tranquila, con todas las comodidades y en un sitio estratégico para recorrer la preciosa isla de Lanzarote. Confortable, village à proximité, parfait pour se reposer et suivre de loin son business. Golf: Golf Course in the town of Costa Tequise, which is around a 20 minute drive from the villa. 'The course is designed to be both smooth and varied. Its numerous doglegs stimulate players and require them to bring all their clubs into play.' 18 holes, par 74. We will need to receive a 20% deposit to reserve your holiday dates in our calendar and full payment should be received 6 weeks prior to the date of your holiday. If a last minute booking is made (within the 6 weeks of the holiday date), payment should be made in full.